Fast forward to last Thursday. Kyle and I rolled into the Paradise parking lot at Mt. Rainier National Park around 8:00pm and found a parking space in the overnight lot. 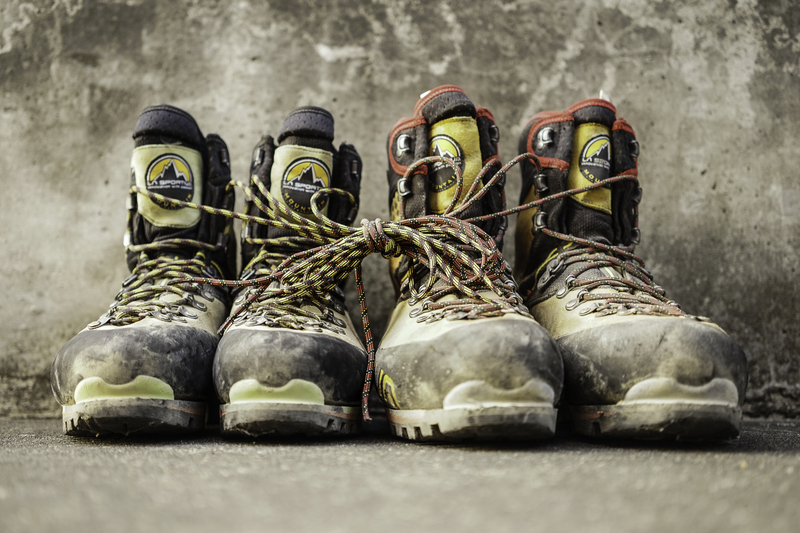 We then proceed to spew all of our belongings all over the asphalt, laying down the seats and blowing up our sleeping pads, prepping for a night in the car before heading out the next morning to begin our attempt to climb Mt. Rainier. By 8:00am the next morning we were all packed up and ready to go, carrying heavy packs because we planned to camp for two nights, once at Camp Muir and once at Ingraham Flats, before making our summit bid. I had an American flag in honor of the 4th along for the ride and Kyle was donning his victory sword, a purchase made at a fireworks stand on the drive to Rainier. Our group was eight strong, made up entirely of members from our Boealps climbing team. When we left the parking lot around 8:30am it was already hot. The climb up to Camp Muir is a grueling 5,000ft of elevation gain over four miles, much of which takes place on the Muir snow field. The snow field rolls on, presenting you with never-ending knolls that seem like the top until you reach them and discover you aren’t there yet. Kyle and I took our time, my body still exhausted from a week of trail work. The sun beat down on us and the elevation continued to build until we finally made it to Camp Muir around 1:00pm. This was where we camped our first night, at 10,188ft. We found a sweet spot to set up all of our tents, isolated from the rest of the climbers who were packed onto the snow closer to the privies. We later discovered that we had set up where the RMI guides usually camp. We managed to make peace and subdue the dirty looks we were getting from a circle of disgruntled guides with a couple innocent apologies. The drama with the guides was the most eventful part of camping at Muir, other than that we laid in our tents, drank water, melted snow, walked to the privies, stopped to catch our breath, walked back. Meanwhile a fire started on Mt. Adams and the Park Service Ranger surveyed his realm from his little stone hut’s front doorstep. The next morning we were all awoken by Kyle’s impressive flatulence and my gagging as I frantically unzipped the tent door to escape the stench. Mountain House really does incredible things to his insides. We all packed up and were moving onto the glacier by 9:00am. The trip to Ingraham Flats in only about 1,100ft elevation gain and we arrived by 11:00am. Once again we unpacked and set up camp, boiled water and retreated to our tents where we all had the goal of achieving a state of maximum restfulness in preparation for our summit attempt that night, scheduled to being at 10:00pm. Kyle and I cozied up in our tent, which was shockingly cold despite the sun radiating off the snow around us, and listened to Invisibilia podcasts until 4:00pm when it was time for dinner. Between 5:00pm and 9:00pm we attempted to sleep a little bit, but were continually awoken by the sound of seracs crashing somewhere far above. Regardless of our eyes being open our bodies rested in their horizontal position, refueling for the climb ahead. We awoke from a fitful sleep before the sun had set. In the dusk we all clipped into the rope which we had prepped after dinner, clicking on our headlamps as the sun slipped below the horizon, and filing out of camp, the rope stretching taught between us, our life line for the next ten hours. The fun began, not even ten minutes out of camp, when we reached our first ladder crossing. Over a crevasse. That is right people, a ladder, covered with two ancient looking pitted boards, was our path over the deep and gaping crevasses that crisscrossed our way up the mountain. The first one was the worst, butterflies seemed to be trying to escape as I hesitated on its edge, trying to decide whether or not I should shine my headlamp into the darkness that existed just bellow the rim of the crevasse. I decided against it and in three quick steps I was on the other side, adrenaline pumping through my veins. Soon we were on the cleaver, an outcropping of rock that provides 500ft of scrambling before spitting you back out onto a snow slope. At the very top of the cleaver another out-cropping offers a safe place to rest and unrope. From here we could see the train of headlamps leaving Camp Muir, a continuous stream of points of light, all flowing up the mountain towards us. But we had been the first people to leave Ingraham Flats and we packed up from our snack break before the other teams that had joined us could get ahead, setting off into the ice falls alone. The next leg of our journey was the most treacherous, as we wove amongst huge ice blocks and along a foot wide path next to a steep cliff, clipped into fixed lines left by the guiding services. We crossed three more ladders, the last of which was the grandaddy of them all, spanning a crevasses eight feet wide. The whole time my alarm on my phone buzzed in my pocket because I didn’t want to take my gloves off to fix it and occasionally when I would lean against the ice bank Siri would inform me, “Siri is not available, connect to the internet.” “Shut up Siri,” I would mutter. We made it to Camp Comfort, took a pee, and continued on, climbing higher to where the wind started to whip, quickly dropping the temperature and making us stop to add layers. We crossed snow bridges that looked like, with just a couple more sun rays, they might just melt into oblivion. We pulled ourselves up slopes with ropes anchored in the snow. We followed a solid bootpack up the mountain and we continually checked the elevation on Kyle’s watch until suddenly we crested and stood looking down into the crater. The crater is a completely flat wide expanse of snow formations called penitentes and right down the middle of it is a path leading to Columbia Crest, the highest point on Mt Rainier. We quickly popped out of the wind to drop our rope and harnesses. Despite the elevation and the cold I felt great, filled with joy and adrenaline. We headed to the summit. 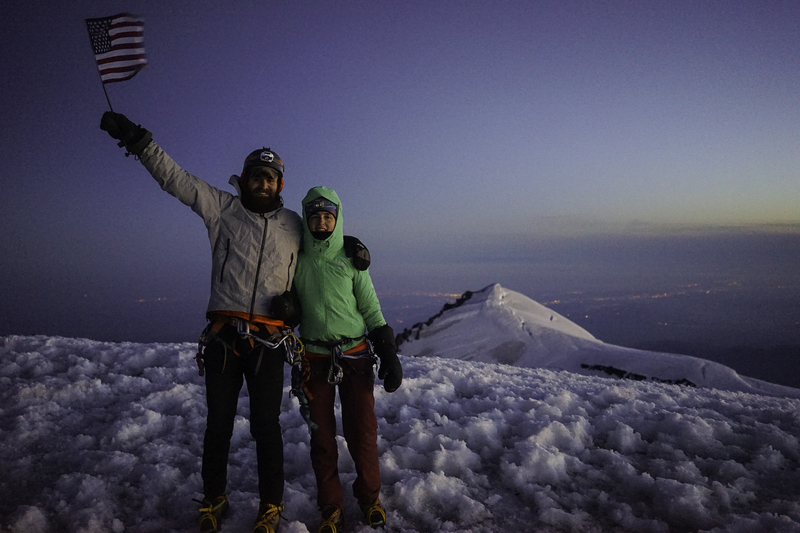 We stood on top of Mt Rainier at 4:37am, after six hours of climbing. The sun was barely rising, but we felt the rare privilege of having seen the sun set and now, rise again. It was windy and cold. I asked Laine if he would take a picture of Kyle and I. We held the American flag aloft and then I asked if we could take another. I turned to Kyle and started crying. “Lindsey, why are you crying, come on, let’s take this picture and get off of here, it is freezing.” I sucked in a deep breath and despite having planned a lot of different things to say in this moment I blurted out, “Would you wanna marry me?” Kyle’s face changed instantaneously. He was both surprised and shocked, but a look of bashfulness crept in as well, and a smile was tugging at his lips. “What? Are you serious?” “Will you marry me? Do I need to get down on my knee?” His eyes had tears in them now but he was laughing, “Yeah, you should!” I went down on a knee for only a second before he was pulling me back up, laughing and hugging me, “Yes, of course I will marry you.” Soon we were engulfed in hugs from the others. And then Kyle lit his victory sword. I had, of course, been planning this moment for months. If you know anything about me you know I am a planner. But I didn’t realize until a few days later that this was a truly ironic proposal. Three and a half years earlier I had told Kyle that if he ever climbed Mt Rainier I would break up with him, but on July 5th I proposed to Kyle on the summit. It is exactly this change in me that makes me want to spend the rest of my life with this man. If someone can take you, full of fears and stubbornness, and gently coax you to face your fears and become a bigger better stronger surer person, that is a person worth keeping around. These last few years have been filled with the most amazing and emotion filled adventures and all the while Kyle has been walking next to me, softly at my side, supporting me, evolving with me, evading stagnation and stirring the pot with his own desires and intrepid nature. I have known for a long time that he is the one who will continue to push me, throughout my life, and marriage at this point is more of a formality and an excuse to throw an epic party. But the proposal, for me, was an opportunity to give something back to a man who has been so kind to me, loved me unconditionally, through my lowest lows, and met me at my highest highs. What better a place to tell him how much I love him than the top of Mt Rainier, a place I would never have made it to without him. Moving story. Good for you. If he does all that for you, yes definite keeper. And because you can put up with his “impressive flatulence”, he deserves you.